Penna Olives Spreads are produced locally. 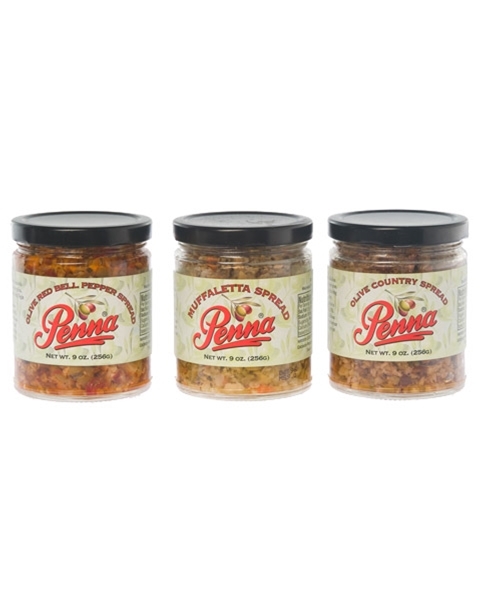 Muffaletta Spread - A delightful blend of premium California olives and vegetables. Extra Virgin Olive Oil is then added to bring the flavors together. Olive Country Spread - Green Olives and tree ripened black olives prepared with capers, garlic, and other spices. Extra Virgin Olive Oil is then added to bring the different layers of flavor together. Olive Red Bell Pepper Spread - A combination of green olives with sweet bell peppers, capers, garlic and other spices. The finishing touch is the addition of Extra Virgin Olive Oil to roung out the flavor. Use this unique spread as a pasta sauce, a dip, on top of baked potatoes, or in your favorite sandwich. Add to eggs, vegetables, or salads. Bake or grill with chicken, pork, prawns, or fish.